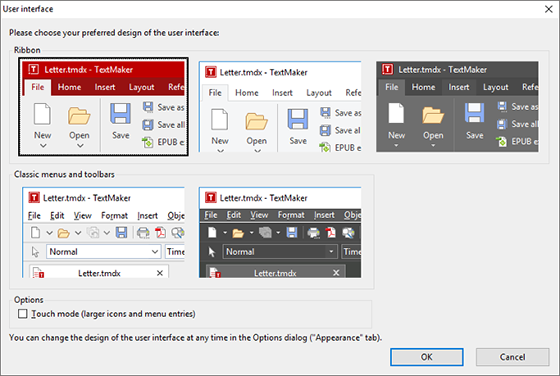 With SoftMaker Office 2018, you can switch at any time between modern ribbons and the classic user interface with menus. Ribbons are a modern type of user interface, which replaces menus and toolbars (by combining them) in order to make it easier to use. Each tab contains icons for a specific topic. The Quick Access Toolbar is displayed below the ribbon. It provides a selection of the most frequently used commands. You can switch the user interface between ribbon and classic menus and toolbars at any time. To do this, invoke the menu command Tools > Option (or, in the ribbon, the command File > Options, etc.). In the dialog, switch to the Appearance tab and click on the User Interface button. A dialog box appears in which you can select the type of user interface you prefer. This gives you the choice to work either with the classic user interface using menus and toolbars, or with modern ribbons. Choice is yours! Note: You can also right click the toolbar and pick User Interface dialog from the menu. Restart of application is required before UI is changed. Ribbons are features of new 2018 version. Previous version user can upgrade to SoftMaker Office 2018 in our online store. Learn more and download trial of SoftMaker Office 2018 here.